That is a realy beautiful dress! I love your blog! I just stumbled across it...following! lovely. can't wait to see how you style it! perfect little dress! this is too cute! this is too cute! great pick! Wow! This dress is adorable! i think it will be erfect for this summer!!! amazing dress!! It's perfect for summer! I would like to find a similar one I'm in love with your!! Hope you visit my blog! Kisses!! Love how the zipper add the perfect amount of edge to feminine floral. just stumbled upon your blog and I am so glad I did, you are the cutest thing and I love your style! I agree we all need floral in our wardrobe for summer. I keep hoping to find the perfect floral pants. hope you visit my blog, I am a fashion design student in NYC. 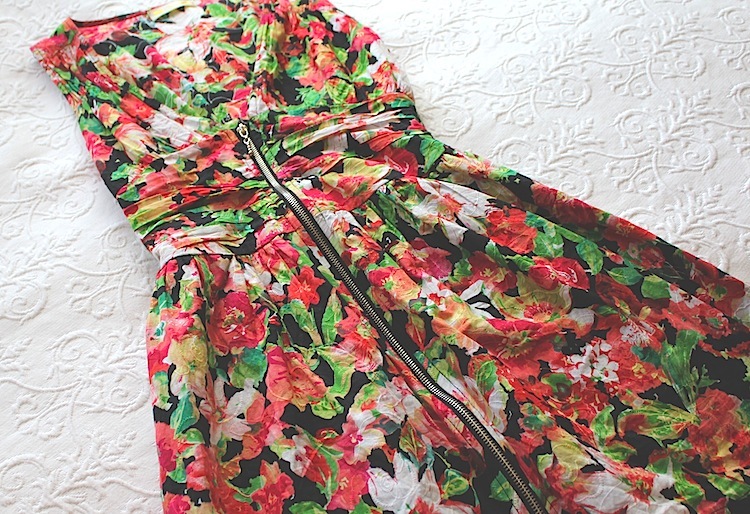 I adore this floral dress...the perfect mix of girly with a bit of edgy to it.